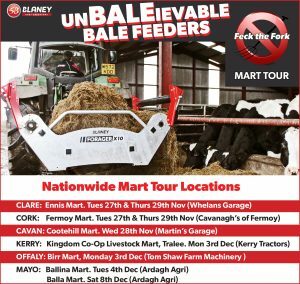 Don’t miss our Nationwide #feckthefork mart tour. If you live in Ireland the Forager X10 Bale Feeder could be coming to a mart near you. Come and find out how this Bale Unroller, made in Ireland could improve your farm profits this winter season. This machine has been designed and built in Ireland, and has been well proven over the last decade. It is a 1 man – 1 tractor machine, which can feed out a bale in seconds, with no wastage. Since the silage is fed fresh cattle find it more palatable for better liveweight gain. Get the feeding done in seconds from the comfort of your tractor seat and no wastage.